Five bodies, five intersecting storylines, five lives . . . each searching for hope and redemption Wayne County Medical Examiner's Office, Detroit, Michigan: October 31, 1999. Five unidentified bodies lie in the Wayne County morgue on Halloween night. Although each character was on a separate journey, fate leads each of the five victims to cross paths on the streets of Detroit en route to their tragic demise. Set against the backdrop of a Devil's Night party at legendary Detroit concert venue and nightclub, Saint Andrew's Hall, Awaiting Identification details the final night on earth for five lost souls.NYC Girl: a former dancer arrives back home from New York City to make amends with her mother and begin to rebuild her life.Leaf Man: a musician and part-time DJ is on the cusp of his big break with one final, unexpected drug deal to complete before he can go totally straight.R.I.P. : a career criminal must come up with a large sum of money to pay for his father's medical expenses, despite his yearning for a crime-free life.The Zealot: a religious fanatic on a mission from God to rid the city of filth.Cat Man: a kind and trusting homeless man wanders the city looking for new friends. 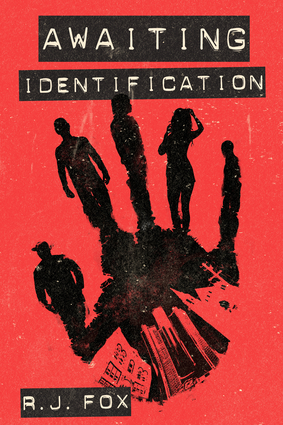 Like the city in which it takes place, Awaiting Identification is a story of hope, identity, and above all, redemption. R.J. Fox is an English and video production teacher who uses his own dream of making movies to inspire his students to follow their dreams. He has previously worked in public relations and as a journalist. He is the author of Love & Vodka. He lives in Ann Arbor, Michigan.